We’re incredibly excited to welcome Kyle Loven and his team back to Portland for our first full-length presentation by a former Risk/Reward Festival artist! Kyle performed a short piece of his epic Moon Show 143 at the 2011 Festival and it premiered in his hometown of Minneapolis’ at the prestigious Guthrie Theater in late 2013. Kyle Loven is a Seattle-based performance and visual artist. His work combines puppetry, projections, objects, sound, and other art forms with the human presence. His live performances (B, my dear Lewis, Crandal’s Bag, Loss Machine, Moon Show 143) have been seen in Amsterdam, Taipei, New York, Minneapolis, Seattle and other US cities. Kyle is the recipient of grants from the Jim Henson Foundation, 4Culture, Artist Trust, and the Seattle Office of Arts & Cultural Affairs. 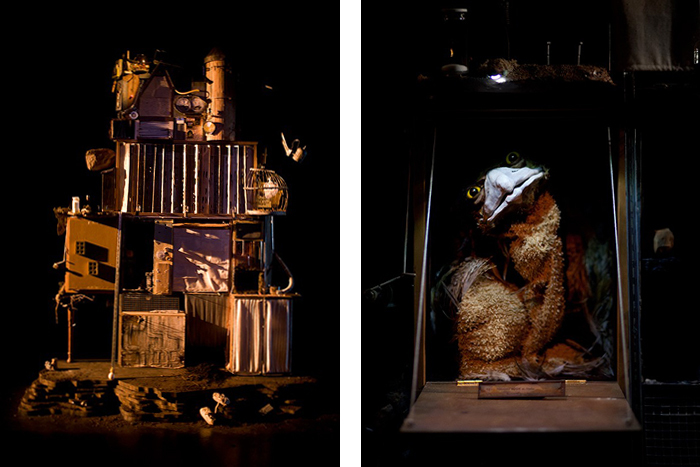 Awards include a 2011 Spotlight Award from Seattle Magazine and the Innovation in Puppetry Award at the 2013 National Puppetry Festival. Ham Sandwich will premiere this June as a part of On the Boards’ NW New Works Festival. Part installation, part image-driven theater, Loss Machine unearths a world of lost items, misplaced thoughts, and fractured journeys all housed within an intricately detailed set. In a tower filled with life’s debris, a collection of characters move through an ever-changing apparatus with their shared emotional journey driving the mechanical process forward. This intimate one-man show combines puppetry, objects, light, sound, and original music in a visual exploration of loss and discovery.